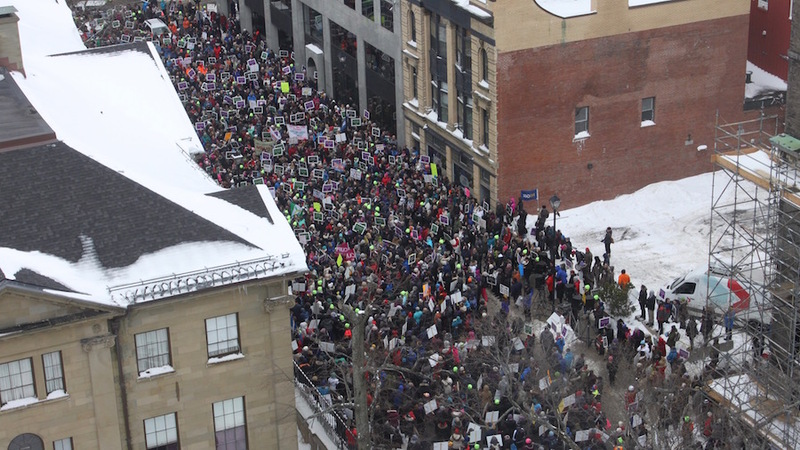 Chants, whistles and the clanging of pots and pans could be heard inside Province House on Friday as teachers rallied outside to protest Bill 75, legislation that would impose a four-year contract onto the 9,300 public school teachers in Nova Scotia. The demonstration was held as part of a one-day teachers strike. Meanwhile, MLAs continued to debate Bill 75 inside Province House. 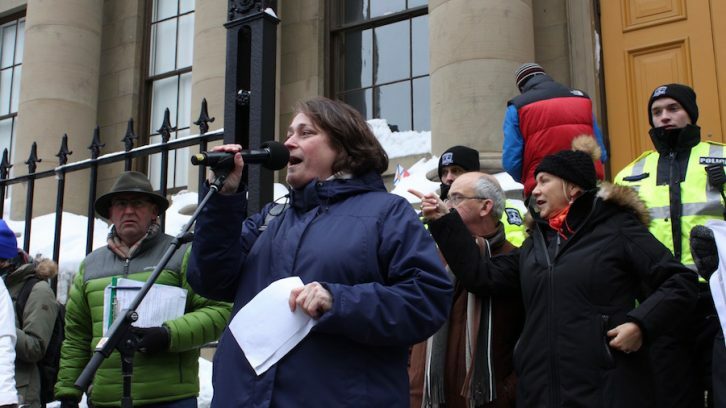 “It’s a proud day for Nova Scotia teachers, but it’s a sad and shameful day for Nova Scotia,” said Liette Doucet, president of the Nova Scotia Teachers Union, in a speech addressing the crowd before the march. This is the first time the NSTU has gone on strike in its 122-year history, according to Doucet. The bill is a combination of three proposed contracts, previously rejected by teachers. This contract offers the least favourable wage package and includes the creation of a council to examine classroom conditions with a $20-million budget. The bill has many teachers feeling frustrated and discouraged. 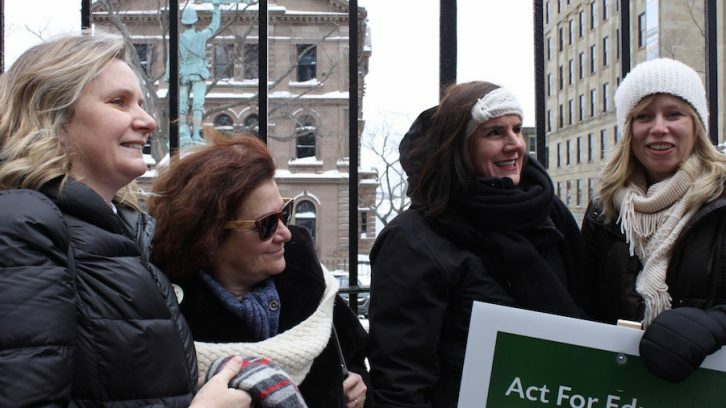 “I see every day how the lack of support teachers are receiving trickles down into the classroom,” said Heather Hollis, who attended the rally. Hollis works with special-needs students in the learning centre at Hammonds Plains Consolidated School. She said students are not getting the resources they need to be successful. “There is only so much support to go around. We have children who are sharing support who need one-on-one attention, but they’re sharing it with six other kids,” Hollis said. Pam Paddock, co-ordinator of Dartmouth All-City Music, said working conditions for staff and students “is in jeopardy” and it has been for the last 20 years. She started teaching in 1996. “From then we’ve had initiative after initiative thrown onto the teachers’ workloads and they have less for students, less resources for changes, and more student problems that our teachers aren’t equipped to deal with,” said Paddock. Teachers have been on work-to-rule on and off since Dec. 5. They’ve stopped contributing to extra-curricular and noon-hour activities such as book clubs and school sports. This has been felt a little more deeply by high school students. LeBlanc said the job action has been hard for smaller communities in particular because there are fewer community activities for young people. The rally in Halifax was not the only one held on Friday. 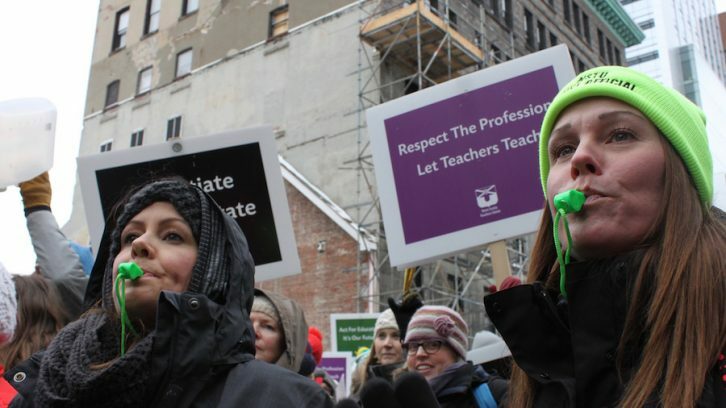 Teachers from other counties, including Pictou, Annapolis and Cape Breton, endured the cold to strike in their respective areas. NSTU has received support from other provincial unions as well. 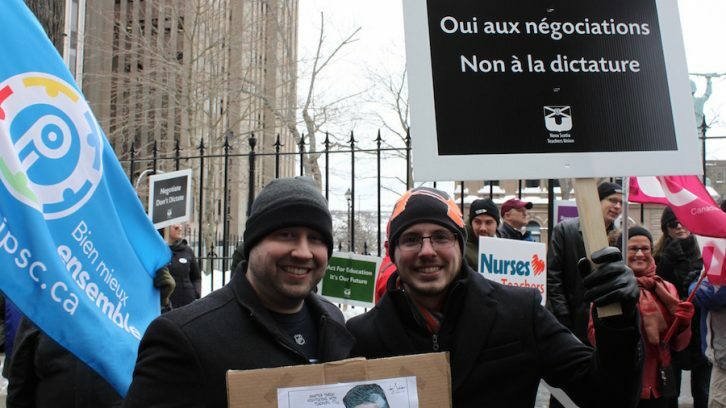 Members from the Canadian Union of Public Employees and the Nova Scotia Nurses’ Union showed up for the rally outside Province House. Members of the NSTU rejected a third tentative deal on Feb. 9. The Liberal government responded by saying it would force a contract on the teachers. Premier Stephen McNeil said he wants what’s best for the province. “It is clear: we must bring an end to this dispute so the lives of students and parents can return to normal,” McNeil said in a news release Feb. 11. The government introduced Bill 75 on Tuesday. A number of witnesses, including many teachers, appeared before the law amendments committee on Wednesday and Thursday to speak out against the bill. 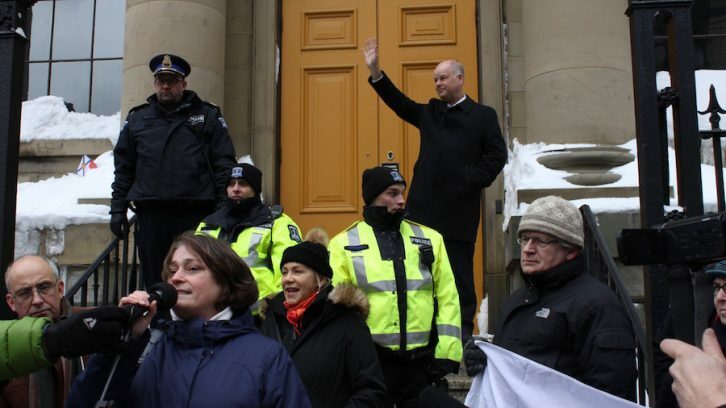 Jamie Baillie, leader of the Progressive Conservative Party, was eager to show his support for the NSTU on Friday, addressing the crowd outside Province House and talking with teachers sitting in the public gallery. McNeil stated he empathizes with the teachers’ concerns but is pressing forward with Bill 75. Teachers are expected to return to their classrooms this Tuesday.